is a remote controlled switch with 5 relay outputs 230V/16A which can be controlled independently via the built in web server from any computer connected to the Internet. It can also be configured as a automatic antenna switch connected to the radios CAT interface . It’s perfect suited for controlling coax relays, controlling 4-squares ,switching the Rig on/off or maybe the Power Amp. No PC is needed, like in USB switches, everything is built in the box and the WEB-switch is connected directly to the local network. An important feature is that the switch is restoring the status of the relays after a power failure. The relay statuses is indicated by LED:s. The settings is optionally password protected. Apps for Android mobiles are available. 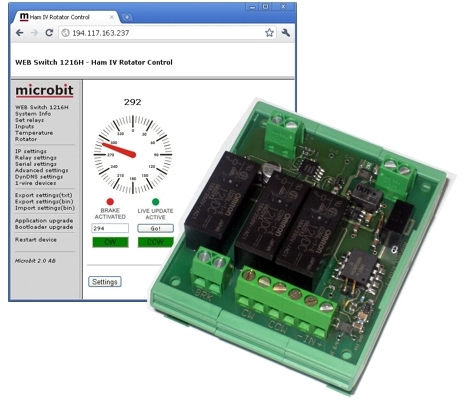 To create a web based rotator control it’s possible to connect a Rotator control Unit (RCU) to the Webswitch 1216H. The RCU is connected via the 1-wire bus to the webswitch. The RCU has three 16A relays for CW and CCW rotation and for break control. For the the azimuth (direction) reading there is A/D input which handles 0-7,5V or 0-15V. The A/D input is fully issolated. The RCU can be connected to most of the current available rotators and rotating tower controls. The indicatior can be calibrated every 30 degrees to handle potentiometers which is not linear. 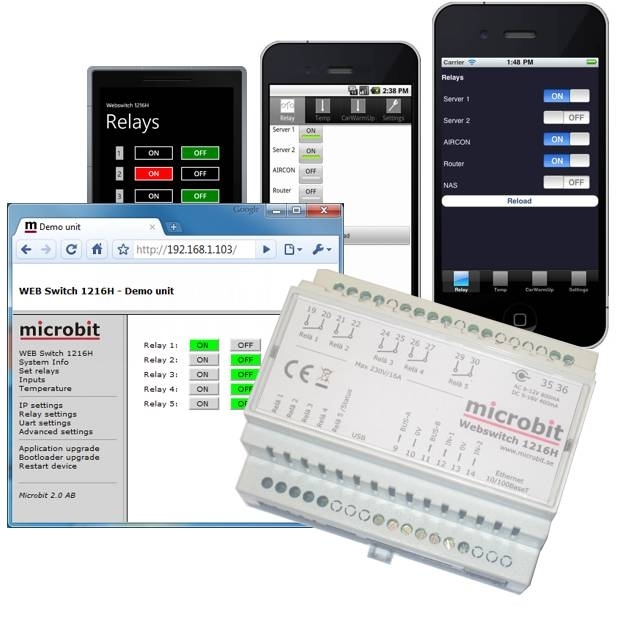 When using the Webswitch 1216H and the RCU 1216L you do not need to use the RRC-serial ports for rotator control. For more info check the RCU 1216L page. 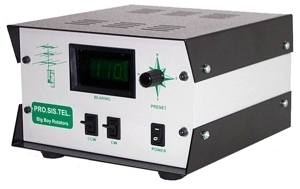 With a RS-232 Adapter cable 1216S you can connect the Webswitch 1216H direct to your Prosistel, AlfaSpid, Green Heron, ERC, DCU-1, Idiom Press or Yeasu GS-232B based Rotator Control box and get a Web based rotator control. Up to 25 1-Wire bus devices (BUS-A, BUS-B) for temperature sensors etc. Can be equipped with a radio transceiver interface for receiving and transmitting Nexa compatible codes. Enables controlling remote switches using the so called Nexa protocol as well as receiving codes from Nexa transmitters. 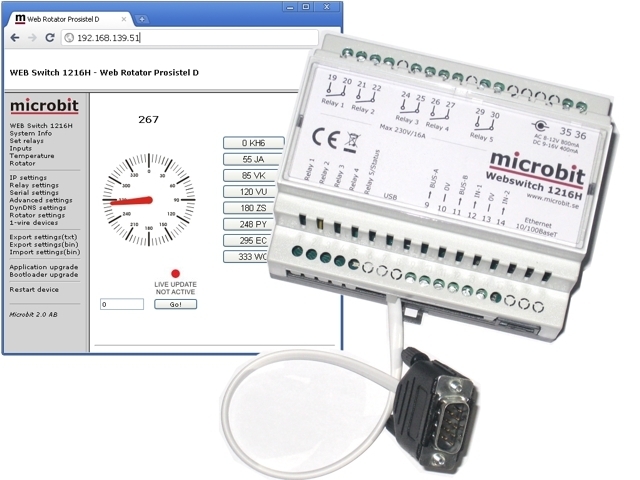 The WEB-Switch can also be used for remote temperature (more info) checks or for temperature control by connecting up to 25 temperature sensor (Dallas DS18B20). The Switch fits into a standard DIN-rail system (6M). There are lot of cheap DIN-boxes which can be used for outdoor installations.